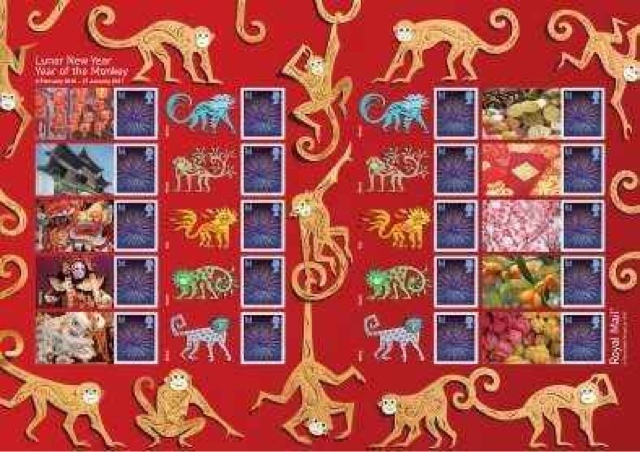 Commonwealth Stamps Opinion: 643. Qatar Posts And Goes. 643. Qatar Posts And Goes. Despite numerous grumbles from collectors (including myself), Royal Mail's Post And Go labels and stamps seem to go from strength to strength. After The United Kingdom, Jersey, Guernsey and Gibraltar who would have thought that the Gulf state of Qatar would be the next territory to have a Royal Mail IAR kiosk set up there? But now on sale on an Internet auction site, offered by the dealers Vaduz09 in Spain and atm1976 in Germany, are 2 sets of Post And Go labels issued in the name of the Qatar postal service, Q Post, from 2 new kiosks, QA01 and QA02, which were situated at the Landmark shopping mall in Doha to coincide with the 20th GCC Stamp Exhibition which lasts from 29 September 2015 to 3 October 2015. 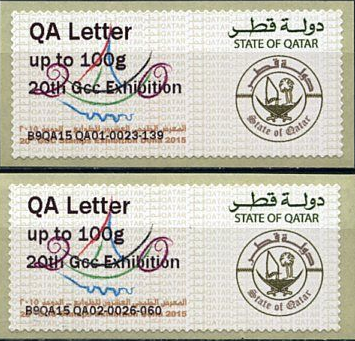 Each kiosk appears to have dispensed 2 different "Collectors' strips", each of 4 different labels, in the rates:- internal Oatar Letter up to 100g, GCC (Gulf Cooperation Council) area letter up to 100g, EU letter rate up to. 50g and Worldwide letter rate up to 50g. 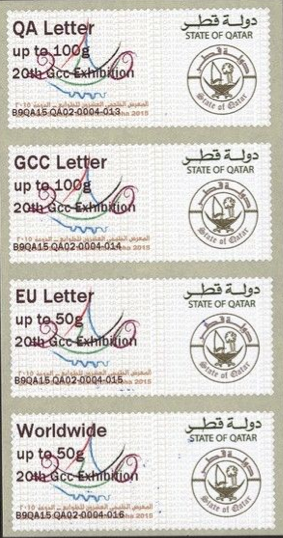 The 2 types of strips are being called "definitives" and have a depiction of the State Arms of Qatar depicted on them and "commemoratives" which have an added multicolour depiction of the stamp exhibition logo applied to them. As much as I complain about excessive Post And Go issues, I like this issue if only because it represents the first use of these products by a postal administration outside of Britain or a British or Crown territory. I think they represent a notable development in the modern postal history of Royal Mail - co-operating with a foreign country, with which Britain has very close links, by having its technology used in that country. 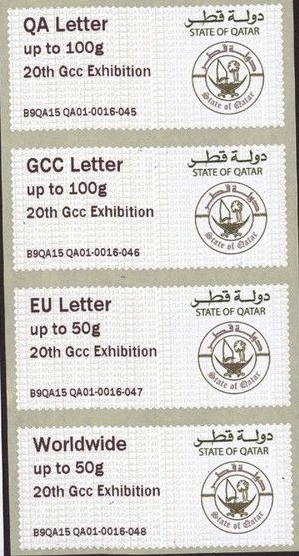 These are not just Post And Go Exhibition labels produced on behalf of a postal administration at an exhibition in a foreign country where they have no postal validity but they are actually being dispensed in Qatar itself where they are valid for postage on local mail. For Post And Go collectors they are an absolute must and are very interesting for the general collector of new issues. I've already ordered my set! Rating:- *****. 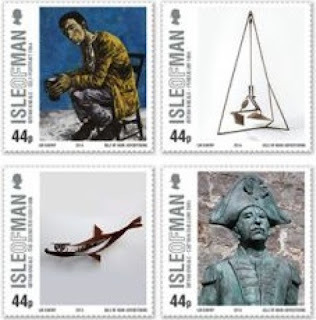 Of course, it isn't all good news for Post And Go collectors, the ever helpful Norvic Philatelics Blog has recently drawn collectors' attentions to announcements on the Royal Mail and Intelligent AR Post and Go sites which suggest that, unbelievably, there will be approximately 150 Post and Go stamps/labels issued in the next few weeks. It's a bit too exhausting to go into detail here for the present. 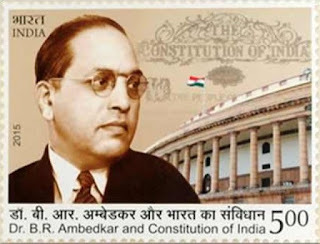 India Post issued a single stamp on 30 September 2015 which commemorates the 125th anniversary of the birth of Dr. B R Ambedkar who was one of the architects of the Indian national Constitution. Rating:- **. 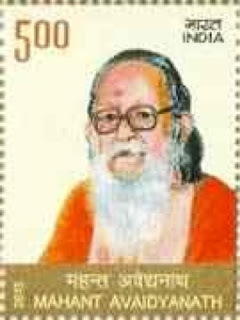 Another issue was also released the following day on 1 October 2015 to commemorate the first anniversary of the death of Mahant Avaidyanath (1921 - 2014) who was a spiritual leader and politician. Rating:- **. 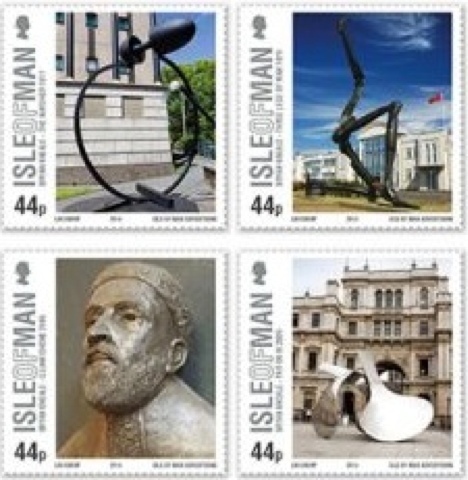 Isle Of Man Post Office issued 10 stamps on 1 October 2015 to commemorate 6 decades of work by the Manx artist, Bryan Kneale RA. The set depicts examples of the artist's work. Rating:- ****. The Sri Lanka Department of Post issued a single stamp on 24 September 2015 to commemorate World Maritime Day. 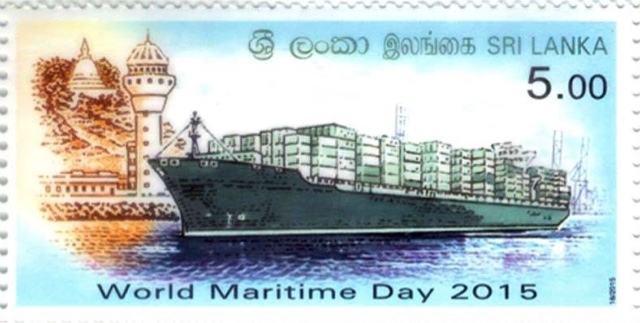 The stamp was designed by DG Sudath Jayawardena. Rating:- ***. Pos Malaysia will issue a single stamp on 9 October 2015 to commemorate World Post Day. Rating:- **. 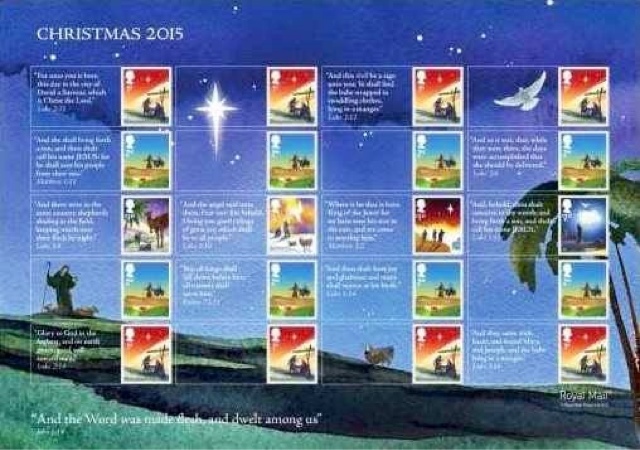 Royal Mail's Christmas issue, due for release on 3 November 2015, takes the theme of scenes illustrating the Christmas story by David Holmes. The "Generic sheet" to be released with the issue includes quotations from the King James version of The Bible alongside the illustrations. 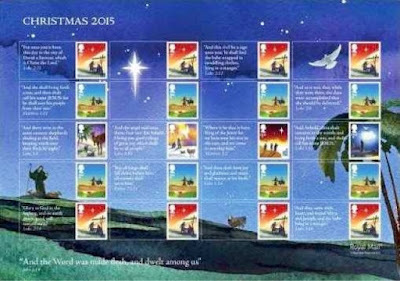 The sheet includes 6 different stamps from the set which are 2nd class rate, 1st class rate, £1, £1.33, £1.52 and £2.25p. Rating:- ****. 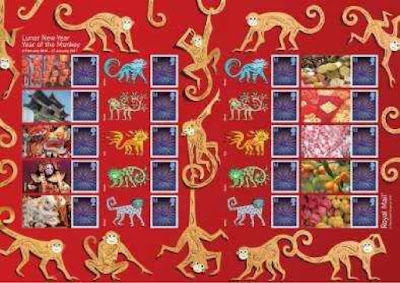 Just 6 days after the issue of the new Christmas stamps, on 9 November 2015, Royal Mail will issue another "Generic sheet" on the subject of the Lunar New Year which will be the Year of The Monkey. The item was designed by Rebecca Sutherland. Rating:- ****. 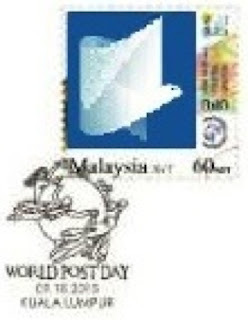 You have shared the wonderful information about postal stamps and it is very valuable. And I've been searching for similar information for a long time, which has been received through your blog. Thank you so much for sharing this kind of information. 655. St. Crispin Crispian's Day. 654. India - Guarding The Borders. 650. New Zealand Post Explores Antarctica. 646. Post And Go's World Tour. 645. French Ship Lands At Mauritius.